Gillian Roy receives a Christmas hamper from Bruce Nixon of building firm Sir Robert McAlpine. The construction firm building Fitzroy Place on Mortimer Street has teamed up with a local charity to provide Christmas hampers for pensioners living in Fitzrovia. Sir Robert McAlpine has paid for 150 hampers which are being distributed by the Fitzrovia Neighbourhood Association to elderly residents. The hampers contain a selection of basic groceries and a few luxury items to help over the festive season. Pete Whyatt a volunteer with the Fitzrovia Neighbourhood Association (FNA) is helping to distribute the hampers with Bruce Nixon from Sir Robert McAlpine. Pete told Fitzrovia News: “It can be quite a difficult time of year for the elderly seeing folks out celebrating and as you get older and with the colder weather of late. This scheme has been great for the community, we have had a chance to visit folks who are housebound and also get to meet older people who we have not been in touch with before. 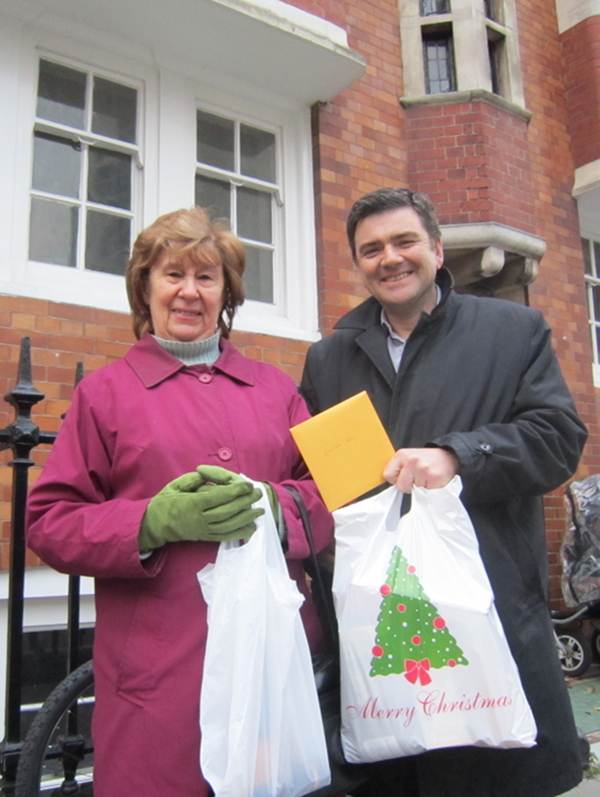 “Many pensioners have expressed their thanks and delight on receiving the packages” says Pete. The FNA is also working with local chemist Shiv in Great Titchfield Street and All Souls Clubhouse in Cleveland Street to help get the hampers to elderly residents. There are a large number of pensioners living in Fitzrovia, many of whom are isolated as many of their friends and family have moved away as the area has undergone change. Many older people are not able to leave their flats without help. During their working years they were part of the population employed in the hospitals, theatre, and fashion and arts industries. Many of their stories are told in the 2010 book “Ebb and Flow in Fitzrovia” a collection of memories and oral history by Fitzrovia’s pensioners, published by the FNA. The FNA has been running a project mostly funded by the Big Lottery and local engineering firm Arup to support Fitzrovia’s older residents. The project is delivered from the Fitzrovia Neighbourhood Centre in Tottenham Street and at Fitzrovia Court, a sheltered housing scheme in Carburton Street run by Westminster Council. The project is organised by Barb Jacobson who runs social activities such as singing classes, poetry sessions, gentle exercise, computer help, and cultural events. The Fitzrovia Neighbourhood Association annual charity appeal has been launched.